For a number of years now, ICON Sports Coaching (formerly known as, Motivational Lifestyle Team in the Community) have run School Holiday Camps using great indoor and outdoor facilities. Our Enhanced DBS Checked, Qualified and Motivated Coaching Team aim to provide a fun filled and friendly environment, where every child is active, makes new friends and enjoy themselves, inside or outside, whatever the weather!!! Please "Click" on the "School Holiday Camp Leaflet" below for information prior to Booking & Paying for your child/children. Child/Childrens Name(s), Holiday Camp(s) attending, D.O.B, School, 9-1 / 9-4 / 9-5, Dates Attending, Any Medical Conditions. 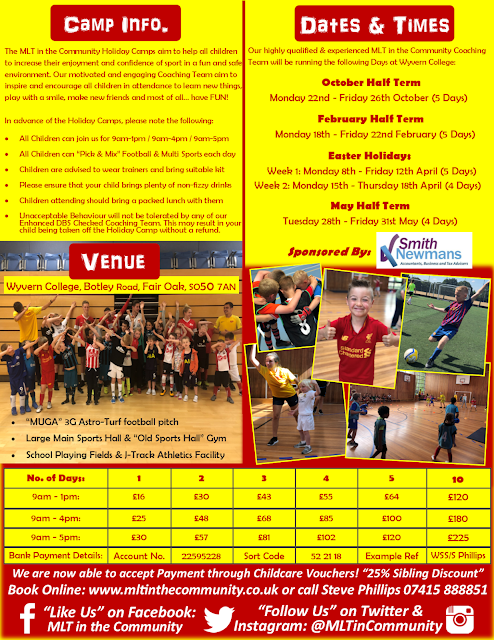 Please ensure You Quote a Holiday Camp Reference & include YOUR child’s name. 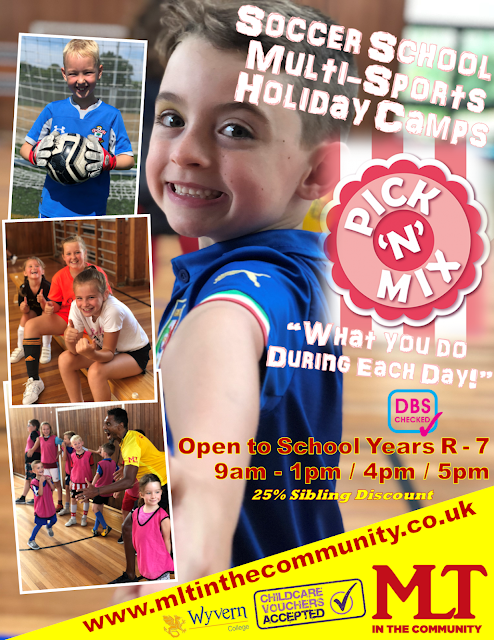 "Mix & Match between Soccer School & Multi-Sports!" Who can attend? ALL Year R - 7 children from ALL Schools! If you are using a 1 Day or 3 Day 9-4 Pass please ensure you record this on the "Contact Form" above and Pay for the other days attending. Please bring the Pass with you each day until it is fully used. Important - I accept that this Booking and associated Payment is made on a “No Refund Policy” basis. All Children must bring appropriate clothing for playing indoors/outdoors, footwear, shin pads (Soccer School only) and bring plenty of non-fizzy drinks. I accept that no liability in respect of loss or damage to personal property or effects is accepted by ICON Sports Coaching Ltd or their servants whilst my child is attending one of the above named School Holiday Camps. I understand and accept that ICON Sports Coaching Ltd have the right to cease the attendance of my child without notice or refund of payment in the event of unacceptable behaviour, ill discipline and causing a disturbance, which is unable to be dealt with by their servants whilst my child is attending any of the above named School Holiday Camps.